The past few years it's become really evident that we have become super relaxed in how we communicate with each other. From writing entire sentences with just single letters to fear of replying to messages too quickly that we totally forget to reply at all. 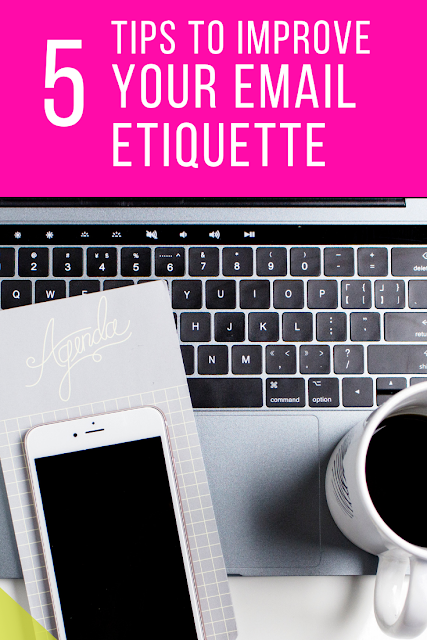 Since we can't get away from writing emails in the majority of our work and personal lives we should really make sure we're following certain etiquette. You might be rolling your eyes at me right now but trust me it makes a huge difference not only with how people view you professionally but also how much your friends and family enjoy communicating with you too. This is probably the most important one in my mind and probably the one I am the worst at. With being able to check on multiple devices there are more than a few times where I check on my phone because I'm on the go then totally forget to reply when I have time or I just don't have time because I'm running around. This can be such a deal breaker when I'm trying to connect with brands and people in my professional life so I'm working really hard to fix this bad habit. I cannot tell you how many times I have gotten an email reply that only answers the first question I asked out of a longer email. When you're working on a project and someone has to email you multiple times to get you to answer their questions it's super frustrating. This can really slow down a project. This goes hand in hand with answering all of the questions. Don't just give a yes or no answer if the reply requires more than that. If you're communicating with family about a get together that's coming up soon don't leave out key information like when you want people over at your house. Leaving out details and key information can make it a very confusing situation and you might end up with half your family at your doorstep three hours before you want them there! I read an article a while back probably from Muse talking about how they found that people who regularly added some sort of thank you to their emails had much better response and relationship with their coworkers. That has stuck with me since I read that so I've made a point to express my thanks in all my emails since then and not just putting thank you but really trying to say things like "thank you so much for taking time to research X for me". I can really tell a difference in the tone of emails I am getting back. Oh no I'm not saying to reply all when you really should be replying just to the sender. I'm talking about when everyone should be in on the email conversation. Sorry Mom but I gotta throw you under the bus with this one! There are times when Bethany, myself and my Mom are carrying on email conversations and she will just reply to one of us then the other only gets part of the conversation. This makes for a very confusing time for the person left out. What is one email etiquette area you're working on? It is definitely annoying when someone responding to an email doesn't address all your questions- I feel that!